Marriage is NOT just a piece of paper. Â Marriage is so much more. Â It is something you have the ability to make or break. You! Yes, I said You! Understanding that Marriage is between two people (one male, one female), you as the individual have the responsibility as well as the power to determine your own responses. One common statement is; “you reap what you sow”, is very true. What are you sowing into your relationship with your spouse or soon to be spouse? Are you sowing positive things such as Love, Gentleness, Tenderness, Excitement, Respect or is it negative, such as Bitterness, Resentment, Discord, Lack ofÂ Appreciation and more? Only you can answer these questions. You do not sow an apple seed and expect a peach tree, do you? Â Of course not. Â So why do you expect to receive something that you are not sowing? God took time out to make sure that an apple seed will grow and apple tree. You don’t plant something and expect it toÂ flourishÂ withoutÂ fertilizer, weeding it, watering and caring for it. Each word you sow is a seed. Each action you take is a seed. Lack of action is a seed. For every word, work, act, or lack of …. you will receive what your have given. Take a moment and ask yourself a few quick questions. Â You can write these down (recommended) or just answer them in your head. 1. When is the last time I told my spouse, “I love you” and really meant it? 2. When is the last time I told my spouse, “Thank you for …..” and really meant it? 3. When is the last time I was thankful? 4. When was the last time I did something for my spouse expecting nothing in return? The list could go on and on if you really think about it. Â Each one of these questions are not something you received, it is something you have sown. 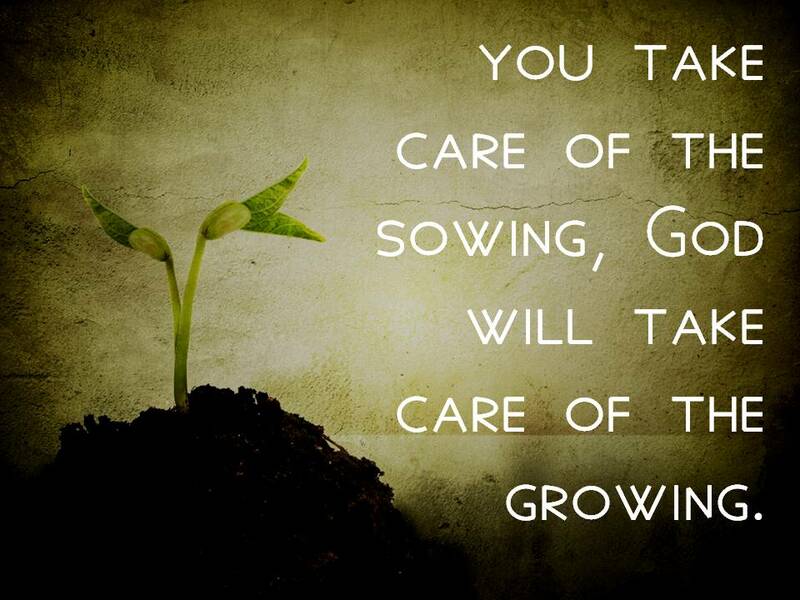 If you are not sowing, you will not reap. Take time out of your day and think about someone else!